If you live in or around the Dunwoody Club Forest area of Atlanta and you lost power on Tuesday evening, July 8th, I believe I can point to a cause. For those of you unfortunate enough to live outside of the southeastern United States, you may not have experienced a unique phenomenon known as the lightning storm. Down here, we have all sorts of storms. We have wind storms, ice storms, thunderstorms, downpours, gullywashers, and the occasional Stormy Waters. In early July, we had one of the worst lightning storms on record. On Tuesday afternoon, I was driving from Atlanta to Charlotte with 2 colleagues for a business meeting. We were on the edge of the storm the whole way up, alternating between perfectly blue sky and downpours so dense you couldn't see the car in front of you. The lightning was impressive. About 25 miles south of Charlotte our backseat driver was discussing the quality of the wiper blades and all 3 of us were, therefore, looking out of the front of the car. Immediately in front of us, on a overpass less than 100 yards away, lightning struck a pole on the right side of the road and a transformer on the left side exploded spectacularly. It was the closest I hope to come to a direct strike. Little did I know that had I stayed home I would have had an even closer encounter. When I returned home on Wednesday, my first indication that something was amiss was that the alarm system showed an intrusion on one of the motion detectors. This is not something that you want to come home to when you're alone in the house. Bravely brandishing a broom (I don't play golf and my kids aren't old enough for baseball yet) I cautiously established that there were no axe murderers hiding in the house. Then I started to realize that the sweating that I was doing was not a cold, nervous sweat but was instead a steaming response to the 90 degree heat inside the home. A survey of the home soon showed that we had lost two air-conditioners, one DVR, all of the telephones, the security system, cable tv/internet/phone service, and one outlet plate that had mysteriously blown across the room without any visible damage to the outlet itself. 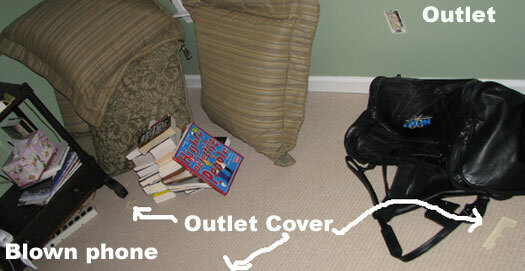 The photo above was taken before I'd moved anything other than the pile of books created as I tried to get to the outlet behind the nightstand. The outlet is working fine and has no charred spots or melted plastic. in other word, the lightning managed to come into my home, rip a defenseless outlet plate from the wall, smash it, toss it around the room, and not visibly damage anything nearby. We're talking scene-from-a-movie-based-on-a-movie-from-Japan kind of stuff, here. Eventually, I worked my way outside to inspect the fallen limbs and other damage. In the back yard, I found several large chunks obviously blown off of a tree, but I could not find the tree that had been hit. Later in the evening, once my family returned, my lovely wife discovered more tree chunks on the roof outside my child's room on the back of the house. However, neither of use could find a tree in the back yard with visible damage. That was because the damaged tree was in the front yard. 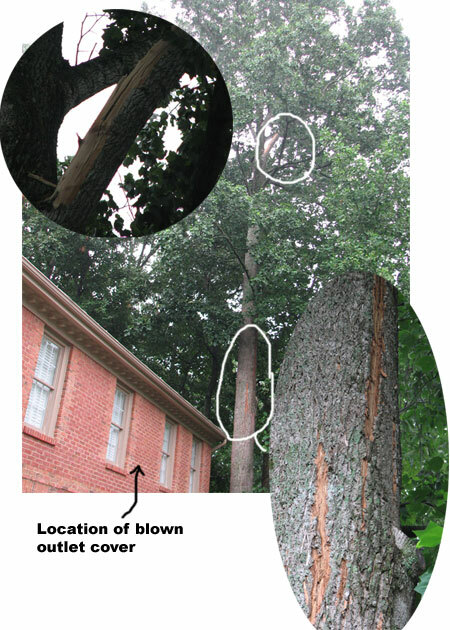 A large branch at the top of the tree was completely splintered, and large gashes were blown off of the tree all the way down. The gashes stop right in front of the spot on the house where the outlet over was blown off inside. The lightning, now provably sentient and certainly evil, traveled down the defenseless tree and jumped into the house through the window, purposefully avoiding most of the surge protection in the house. If we had been home, there is no doubt in my mind that the lightning would have at a minimum found a way to remove our clothing while we were exposed to the neighbors. This is not your normal "electrical charge finding the path of least resistance" lightning. This is "spawn of Clive Barker" evil territory. It has been several weeks since the attack. I discovered that cable/tv/internet service outage was due to a blown RF splitter - but not a single blown television - and we now have restored service. The DVR has been replaced, broken again, and replaced again. The air conditioners were fixed very quickly by our local neighborhood AC expert (two blown control panels, one blown user interface ... it was looking for us). The alarm system is back up and running, after replacing a motion sensor and user interface (see, - looking for us). The outlet cover is in a glass box surrounded by crucifixes and garlic ... just in case.